On beaks and biodiversity on island California, by Katie Langin. In 1835, a young naturalist named Charles Darwin set foot on a peculiar land. Giant tortoises lumbered over barren lava fields, iguanas took to the sea in search of food, and some birds were utterly incapable of flight. He spent several weeks there—on an archipelago called the Galápagos—collecting specimens and observing the remarkable biodiversity in front of him. Many organisms were similar to species Darwin had observed on the South American mainland, but they were clearly distinct, with characteristics that made them well-suited to their island home. Ecuador’s Galápagos Islands played an out-sized role in seeding Darwin’s ideas about evolution and the origin of species, but among islands they are not unique. Archipelagos are renowned for housing bizarre creatures, thanks to their isolation. That’s why, as a biologist, I was thrilled when I got a chance to work on the California Channel Islands. I knew I’d find diminutive foxes and supersized jays. What I didn’t know was even more interesting. As I later learned, there was even more to the islands’ biodiversity than met the eye. The California Channel Islands are made up of eight stunningly beautiful islands: San Miguel, Santa Rosa, Santa Cruz, Anacapa, Santa Barbara, San Nicolas, Santa Catalina, and San Clemente. Many are visible from the beaches of southern California, but they have never been connected to the mainland and house a rich diversity of species found nowhere else.1 They’re home to towering peaks, vast inland valleys, picturesque white sand beaches, and one of the largest sea caves in the world. They also share a remarkably similar evolutionary story with the Galápagos—a story about bird beaks. On the Galápagos, the central character is a group of birds called Darwin’s finches. They descended from a single South American ancestor and, within the past two million years, rapidly diversified into fifteen species that all make a living in different ways.2 Some finches eat seeds, some eat insects, and still others—vampire finches—feed on the blood of seabirds. Each species evolved a beak that’s specifically adapted to the type of food it eats. It’s a classic example of evolution. An island scrub-jay. Photograph by Katie Langin. We didn’t set out to look for this. In fact, we happened upon this discovery while we were studying island scrub-jays for an entirely different reason: to figure out if the species is in decline. (Short answer: it doesn’t appear to be.) We captured and marked hundreds of birds with unique leg bands so we could track their survival, breeding activities, and diet. While handling each bird, we also took a few standard measurements and, on a whim, one day I decided to take a look at those data. Island scrub-jays also live in both pine and oak forests, but it seemed crazy to expect the same beak differences, because the species is crammed onto one 22-mile-long island, where you can walk between pine and oak forests in a few short strides. Normally, scientists assume that evolution generates differences in characteristics like beak shape—or feather color or wing length—only if there’s some kind of physical barrier preventing populations from meeting. Without such a barrier—an ocean, say, or a stretch of inhospitable desert—too much inter-breeding will occur. That’s why islands are home to so many unique species; the geographic isolation inherent in island living makes it easy for populations to diverge from their relatives on the mainland. But within an island, it’s a different story. That’s why it was so surprising when an initial foray into our beak-measurement data revealed that island scrub-jays have longer beaks when they live in the pine forest. The following year, we went back to Santa Cruz and caught more birds to see if this was just a fluke. But the differences only became stronger with data from more birds (all told, we measured 565 birds). Surprising as these findings may be, they’re actually part of a growing trend that’s changing our understanding of evolution. Similar stories have been reported for maggot flies in Eastern North America,6 fish in Nicaragua,7 and songbirds on the island of Corsica.8 All of this questions whether organisms living in different environments need to be separated by a barrier in order to diverge from one another. Biologists rarely look for these sorts of patterns within populations; usually the goal is to look for differences between populations. So the few examples of “microgeographic divergence” that we do know about may mean there’s a lot more biodiversity left to discover out there in nature. It’s not necessarily diversity sufficient to declare two populations separate species (island scrub-jays are still considered to be one species), but a more subtle form that includes individuals that are “locally adapted” to different environments. The information is important because the amount of diversity within a species is one of the best predictors of its ability to adapt to environmental changes. Evolution can do more when it has a wider variety of raw ingredients with which to work. A species may have a better chance of responding to climate change, for instance, if some members are already adapted to warmer microclimates. One example is a monkeyflower called Mimulus laciniatus, which grows up and down California’s Sierra Nevada. Some populations are adapted to warmer conditions in the foothills, while others are adapted to cooler conditions in the higher-elevation montane.9 If the climate warms, plants from warm-adapted populations might survive in greater numbers—and be more successful at passing their genes to the next generation. That could give the species as a whole a better shot at long-term persistence. The importance of preserving diversity could be especially pronounced for species restricted to islands. In the case of the island scrub-jay, individual birds will have a limited ability to move elsewhere if the environment changes, because they can’t seem to fly to the mainland or to neighboring islands. (They’ve never turned up in other places.) Instead, the species will have to adapt to any changes that crop up on the island—or it may go extinct. Protecting the full range of biodiversity contained within the species, currently numbered at fewer than 3,000 birds,10 could be critical for its survival. 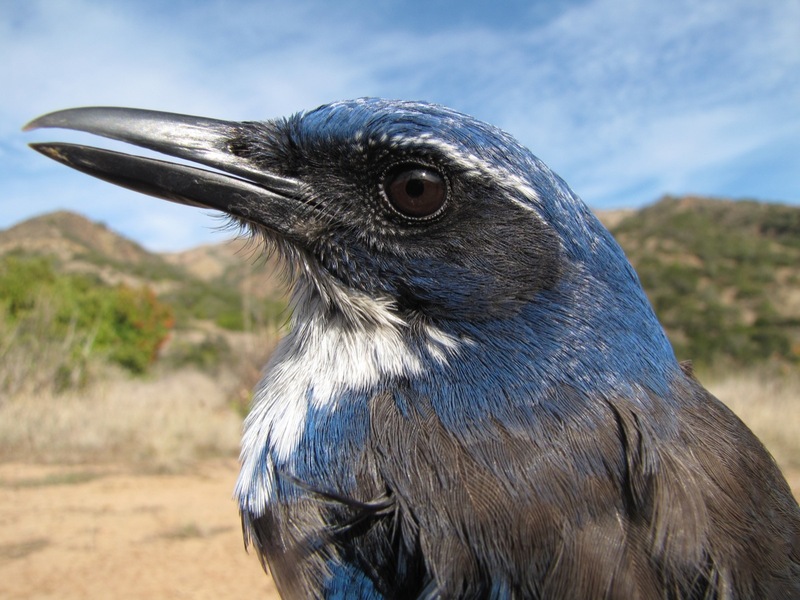 This means that if a threat erupts on Santa Cruz Island—the emergence of a new virus or the arrival of a nonnative predator—it won’t be enough to protect island scrub-jays in one area. We’ll need to protect birds on different parts of the island. Otherwise, we may lose a critical piece of the species’ genetic diversity. Islands are hotbeds for extinction events,11 making it all the more critical that we develop sound conservation strategies on the Channel Islands, the Galápagos, and elsewhere. Too often, evolutionary considerations are left out of the conservation equation. We assume that species can’t quickly adapt to environmental change because it takes time for advantageous genetic mutations to appear. But in reality many species may already have the genetic wherewithal to adapt; we just need to safeguard it. That’s why it’s so important for biologists to identify the breadth of biodiversity that exists in nature, including genetic variation within species. Darwin may have kick-started these efforts on a remote archipelago 180 years ago, but today’s generation of biologists is still working to decipher evolution’s varied results—how they came to be and where they might lead. 1. Allan A. Schoenherr, C. Robert Feldmeth, and Michael J. Emerson, Natural History of the Islands of California (Berkeley: University of California Press, 2003). 2. Peter R. Grant and B. Rosemary Grant, How and Why Species Multiply: The Radiation of Darwin’s Finches (Princeton: Princeton University Press, 2011). 3. Kathryn M. Langin, T. Scott Sillett, W. Chris Funk, Scott A. Morrison, Michelle A. Desrosiers, and Cameron K. Ghalambor, “Islands within an Island: Repeated Adaptive Divergence in a Single Population,” Evolution 69 (2015): 653–665. 4. Elizabeth Bardwell, Craig W. Benkman, and William R. Gould, “Adaptive Geographic Variation in Western Scrub-Jays,” Ecology 82 (2001): 2617–2627. 5. A. Townsend Peterson, “Adaptive Geographical Variation in Bill Shape of Scrub Jays (Aphelocoma coerulescens),” The American Naturalist 142 (1993): 508–527. 6. Jeffrey L. Feder, Charles A. Chilcote, and Guy L. Bush, “Genetic Differentiation Between Sympatric Host Races of the Apple Maggot Fly Rhagoletis pomonella,” Nature 336 (1988): 61–64. 7. Kathryn R. Elmer, Topi K. Lehtonen, and Axel Meyer, “Color Assortative Mating Contributes to Sympatric Divergence of Neotropical Cichlid Fish,” Evolution 63 (2009): 2750–2757. 8. Jacques Blondel, “Selection-Based Biodiversity at a Small Spatial Scale in a Low-Dispersing Insular Bird,” Science 285 (1999): 1399–1402. 9. Jason P. Sexton, Sharon Y. Strauss, and Kevin J. Rice, “Gene Flow Increases Fitness at the Warm Edge of a Species’ Range,” PNAS: Proceedings of the National Academy of Sciences 108 (2011): 11704–11709. 10. T. Scott Sillett, Richard B. Chandler, J. Andrew Royle, Marc Kéry, and Scott A. Morrison, “Hierarchical Distance-Sampling Models to Estimate Population Size and Habitat-Specific Abundance of an Island Endemic,” Ecological Applications 22, (2012): 1997–2006. 11. T.H. Johnson and Alison J. Stattersfield, “A Global Review of Island Endemic Birds,” IBIS 132 (2008): 167–180.